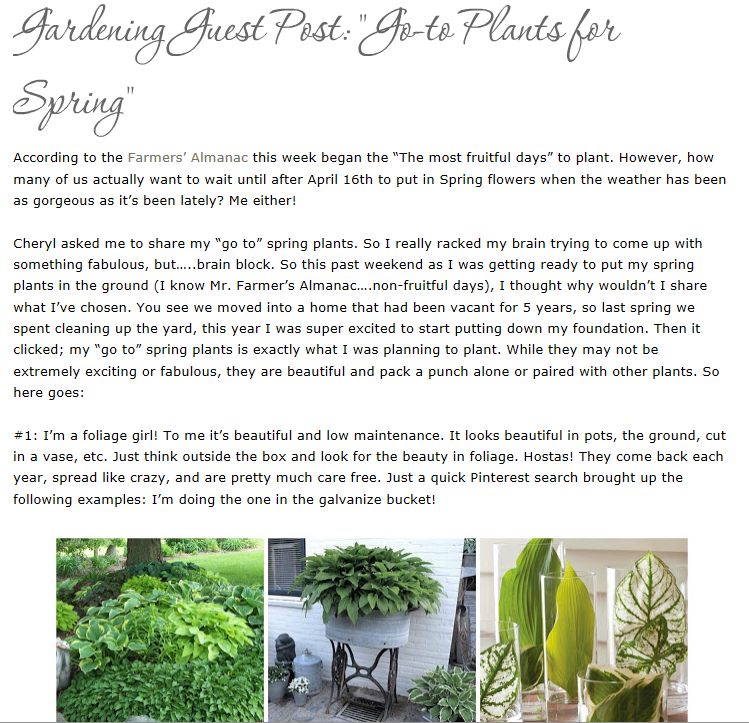 Dwell by Cheryl: Guest Post: "Easy Peasy Gardening with Containers"
Guest Post: "Easy Peasy Gardening with Containers"
Thanks so much for your well wishes on Friday. My install went great and I can't wait to share the reveal with you. However, today I've got a special treat. 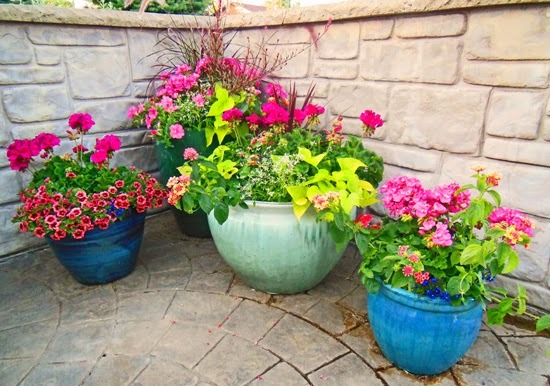 It is so easy to spruce up your deck, porch, pool area, or landscaping bed with containers. They pack a punch and are super easy to care for and can be inexpensive. I'm here today to share several tips that will have you whipping up your own spring containers. 1. Choose a container, be creative! You will also need proper drainage for your container, potting soil, and preferably use polymer crystals. 2. Pair plants that have the same needs and fit the size of the container you have chosen. Don’t put sun loving plants with shade loving plants or plants that need lots of water with plants that don’t, etc. 3. Use plants that thrive in the plant zone where you live. 4. Use the Thriller, Filler, Spiller technique for containers. 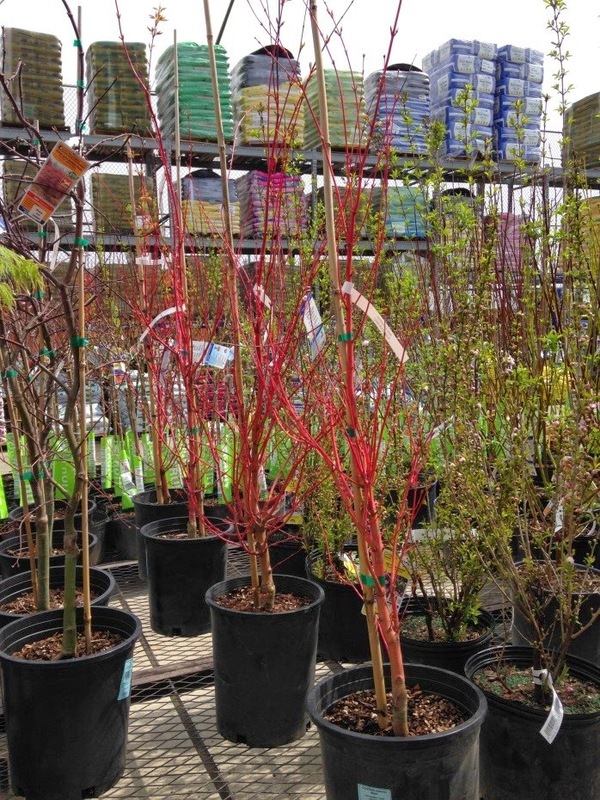 A thriller plant is one that typically adds drama and height. Some of my favorites that grow well in our area (Plant Hardiness Zone 7) are Geranium, Salvia, Hostas, and Ornamental Grasses. 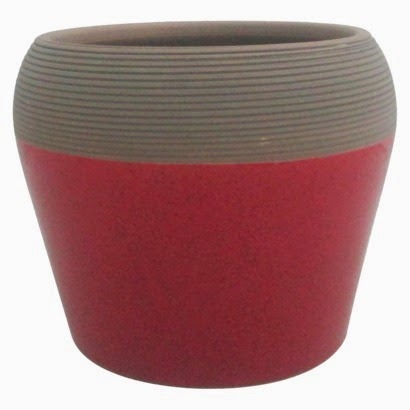 Filler is one that creates fullness and closes space between plants. 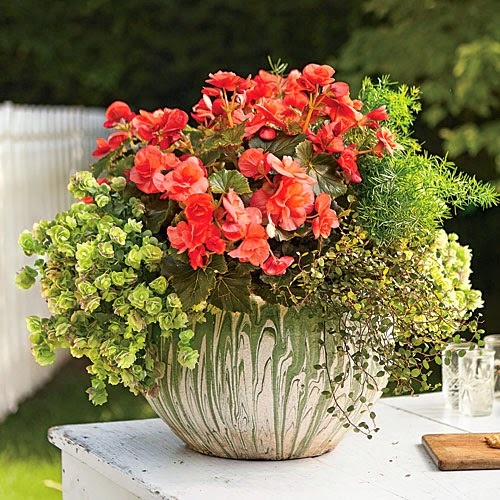 Begonias, Million Belles, and Geraniums (yes it can be a Thriller & Filler). A spiller is one that falls over the sides of your container. Ivy, Creeping Jenny, and my all time favorite spiller is Sweet Potato Vine (comes in a chartreuse and purple).There are so many options using this technique…. 5. 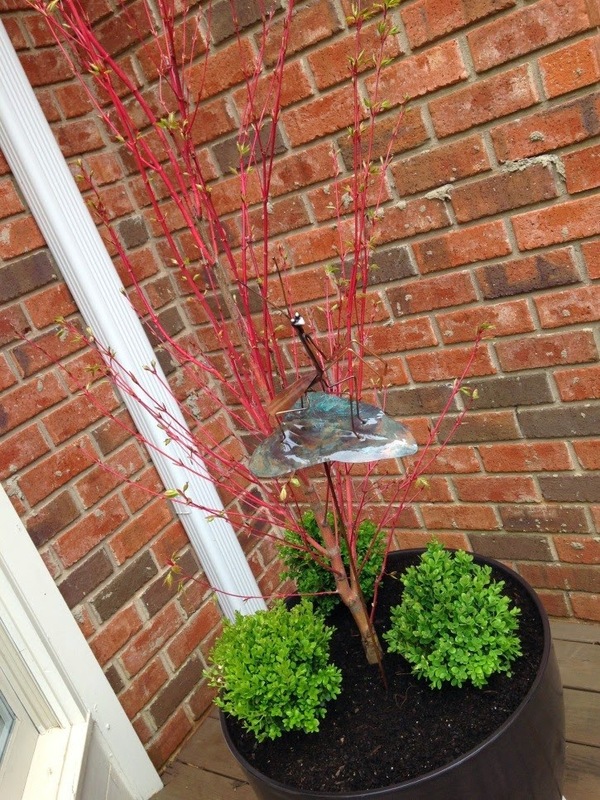 But, don’t be scared to go bold and create a container with a single plant that you love! 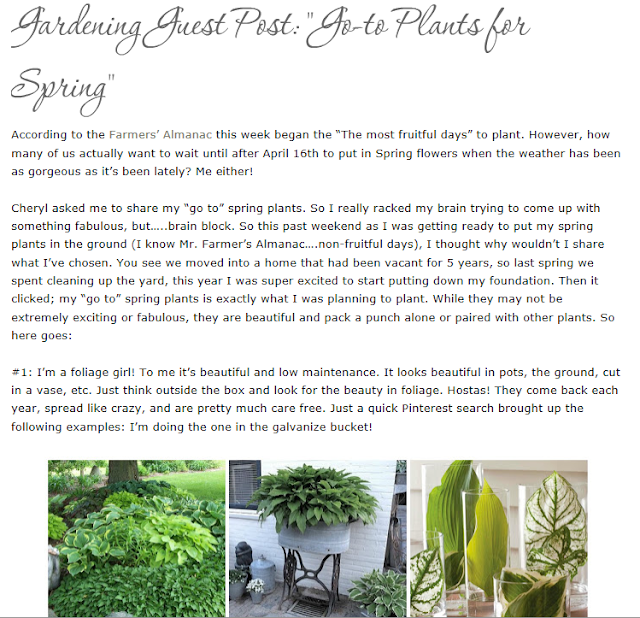 Ferns, Geraniums, Million Belles, Lavender, Succulents or my fav Caladiums…whatever! 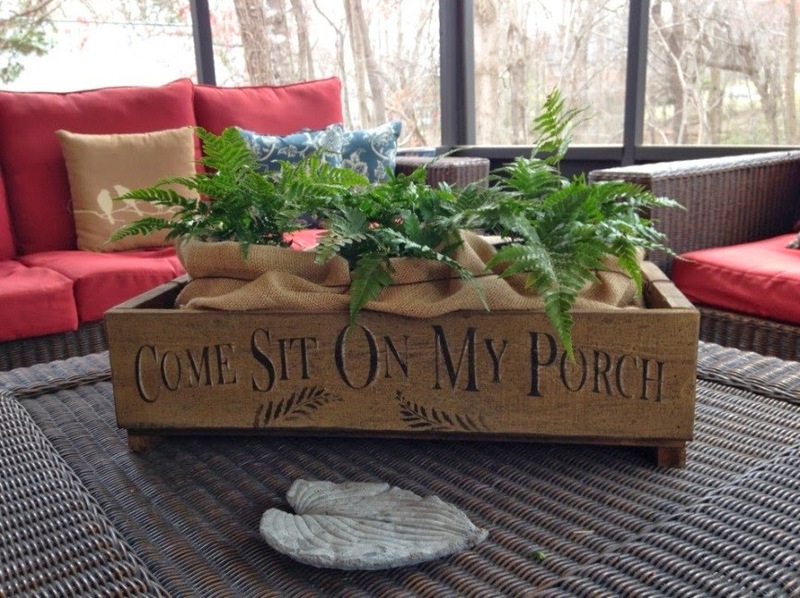 Here are a few containers I put together this year to liven up my screened porch & deck. I tend to be a lazy gardener and lean toward keeping things simple and easy! My first pot is my Thriller, Filler, Spiller Technique…and keeping with my super easy, simple, and lazy ways I wanted something that would be useful year –round and would only require minimal upkeep. So I decided to use a tree that can live in a pot a couple years before being transferred to the landscape as my Thriller. I love Coral Bark Maples – they have beautiful coral branches in the fall/winter and are beautiful trees when they leaf out. My local hardware store had plenty in stock. Miniature Boxwoods as my Filler because they stay green all year, and I’m gonna add Purple Sweet Potato vine as my Spiller when the weather get warm enough. In the fall all I have to do is switch out the Sweet Potato Vine with Pansies and *boom* a beautiful Fall container. I literally just sat the pots that came in inside the crate on clear plastic water trays, and wrapped burlap around to hide the pots. 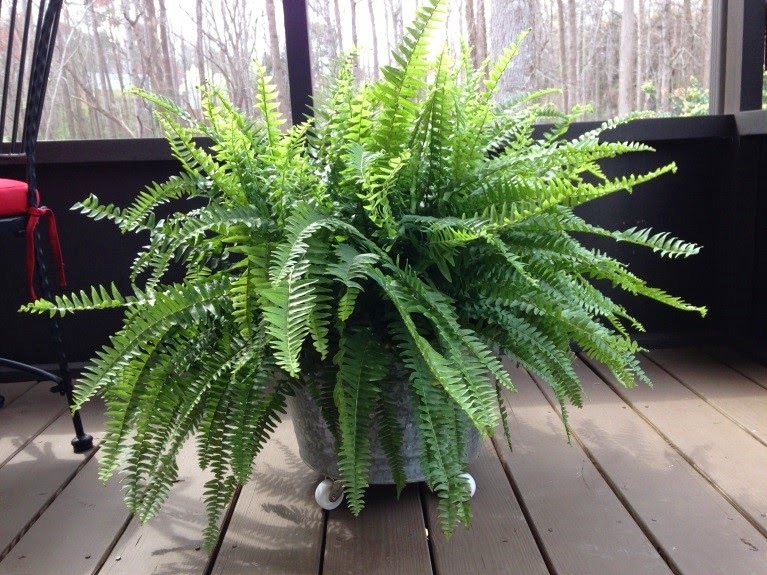 Lastly I added casters to a galvanized tub and sat a hanging fern inside. See … containers can be EASY PEASY! 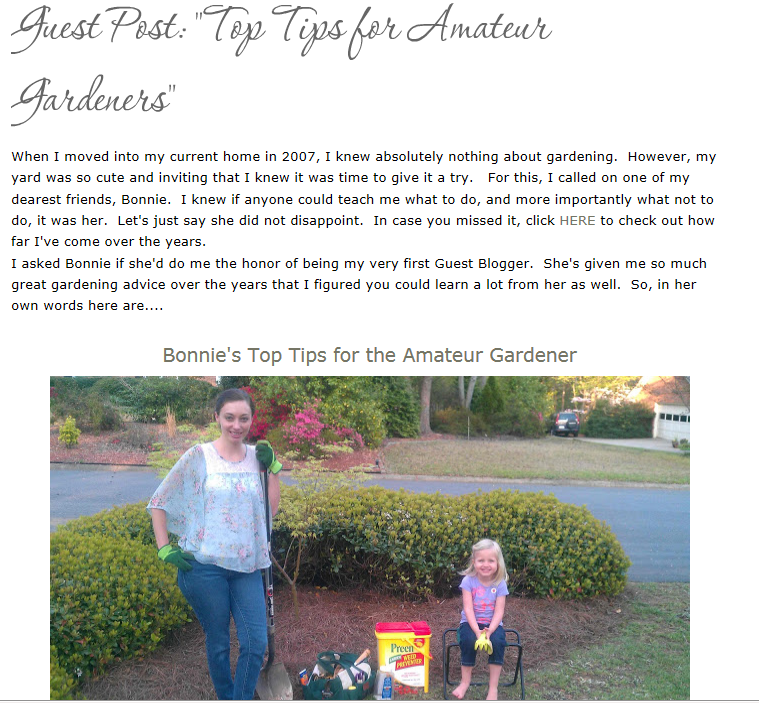 Great tips Bonnie! I took your advice last year and it produced one of my favorite containers. Can't wait to get started this year! 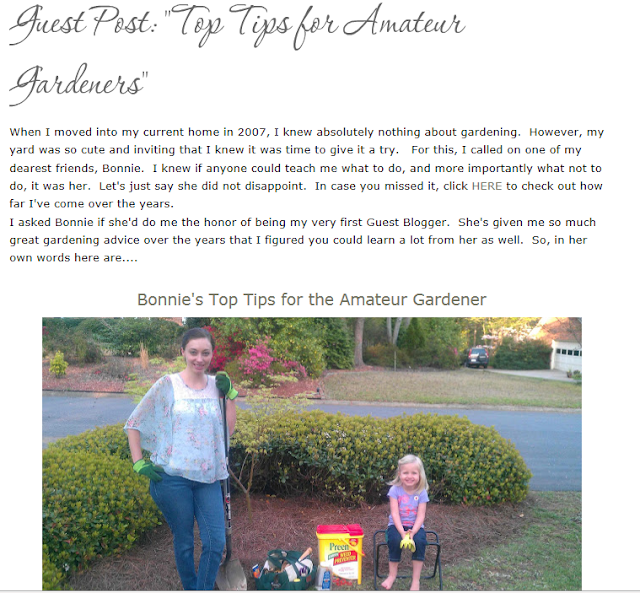 Want to read more of Bonnie's Post? Check out her past annual post below.